Purgatory is said to be an ominous place between heaven and hell and it is also a fitting nickname for these dark, foreboding rocks in the middle of nowhere. Back in the late 1990s when I was a regular here I heard it called Purgatory by a few locals and it kind of stuck (not to be confused with the Purtgatory Boulders in Northern Nevada, obviously). Most people simply call it Putah. If you don’t watch your p’s and q’s, Putah can sound a lot like a naughty word in Spanish—so get it straight. Whatever you want to call it, it’s one of the best roadside bouldering playgrounds in the North Bay. 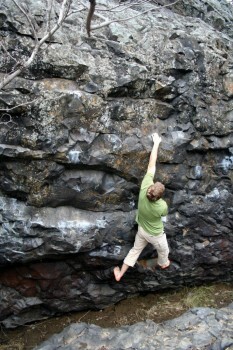 The Purgatory Boulder has a few of the best problems in the guide, all on its clean, overhanging, highball main face. Which SuperTopo guidebooks cover Putah Creek (Purgatory)? Jason Campbell Ken Ariza et al Putah Creek V1R FA - V6 flash!